Probably was expecting a review of a certain Marvel webslinger this week right? In due time readers (hopefully)! But we are keeping it in the family with Marvel’s The Incredible Hulk. 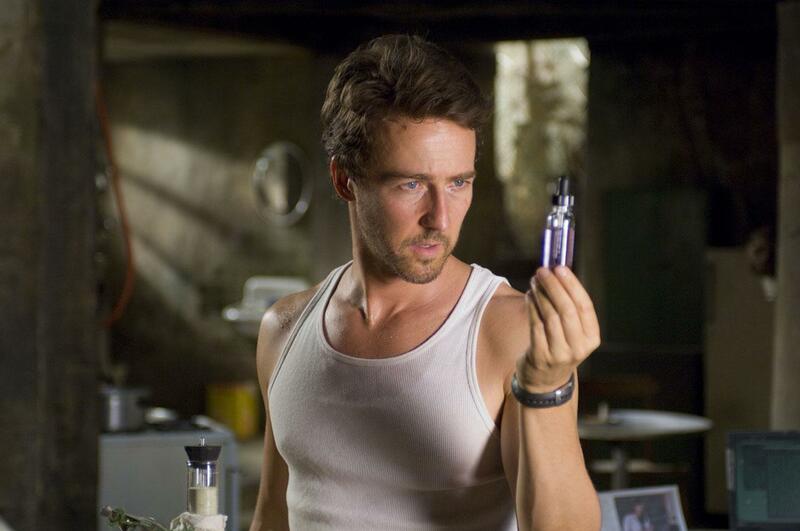 In this version, brillant scientist Bruce Banner (Edward Norton) begins on the run from the U.S. government. Why? Prior to this predicament, Bruce was working with fellow scientist Betty Ross (Liv Tyler) and her military general father Thaddeus Ross (William Hurt) in an effort to find, presumably, a use of gamma radiation for healing purposes for soldiers. Like most scientists, he tests the science on himself, and things go as one would expect. His transformation into a green tinted brute spurs him to destroy the lab and injure many within it. Escaping this, years later he turns up in Brazil, looking to rid himself of this monstrosity. Though off the grid, General Ross gets wind of Banner’s location after an odd accident at the factory Bruce works at. So, the general sends a unit for Bruce’s capture, but Bruce escapes yet again by way of his timely hulking metamorphosis. Still on the run, the scientist resolves to get back to the states to find a remedy to this bizarre “talent” the government so wants to harness. 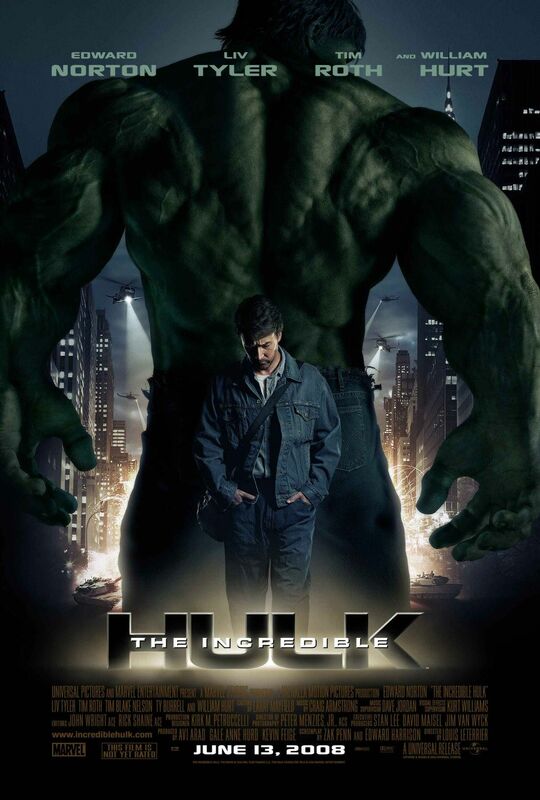 2003’s Hulk, directed under the vision on Ang Lee, left a bad taste in a lot of people’s mouths. Though I didn’t despise it like others, more or less I was one of these people. It just was too slow, meandering and took itself way too seriously. Luckily, the rebooted The Incredible Hulk is a lot more fun, but still missing something for one reason or another. First of all, the movie starts in an interesting way in that Bruce is already living with his affliction, and the initial damage he inflicts while enraged is shown through a montage almost entirely in first person view. At first, this seemed like a mistake in character building, with no build to speak of to this moment. Upon further analysis though, this was a great start to the movie. If the 2003 version taught us anything, it was that too much time in the lab waiting for the inevitable to happen can mar an entire movie. This intro found in TIH reduced a hour of runtime to three or so minutes, while not compromising why Bruce was testing on himself, since it is all explained later effectively enough. An effective opening does not mask the problems of the plot as a whole however. In TIH, the motivation of some characters is hazy to say the least, and it did lessen the enjoyment of it. But the biggest issue with this film is the lack of tension. There is the obvious feud between Banner and General Ross, and later between Hulk and Abomination. Sadly, both fail to carry much weight. The former should, but the clashes between the two are few and far between as either Banner and sometimes Betsy included spend a large chunk of the runtime as fugitives, which becomes extremely dull after a while. The latter, when it occurs, is a huge spectacle. But, it does not come to fruition until the last 20 minutes. It can be understood that the true tension is the internal fight that Bruce has within. This is fine, but it is used as the main conflict, when it is really best served as a supplement. I am not a comic nerd at all, so it is very possible that the Hulk has some more compelling foes in his world. From what I have viewed in movies though, the villains in Hulk lore are unappealing. There aren’t many standouts from an acting standpoint. Edward Norton has shown to be an extremely versatile actor in his career, but here someone else may have been a better choice to be cast. By no means is he awful, but he never really becomes Bruce Banner either, and part of that could be due to his well known status; it just becomes harder for the audience to buy him here. It may have been a wiser choice to bring in someone of lesser stature. It is a respectable performance, but uninspired. In the grand scheme of things, the Hulk character looks to be in great hands as Mark Ruffalo showed in The Avengers. As Banner’s love interest, Liv Tyler’s Betsy Ross is really one note. In almost every scene, she has the same emotion of wonder/astonishment, never bringing anything more to the table. Her chemistry with Norton was OK and nothing more. Pretty good to look at, but her acting chops are questionable. William Hurt is a proven performer, but he is reduced to the standard shady military leader who cannot be trusted. He does what can be done. Lastly, Tim Roth’s character falls into the same archetype as General Ross. He eventually become’s the Hulk’s equal, but in all actuality he serves as a plot device from point A to B to C.
TIH relies a lot on CGI, and all of it looks great. More so than any previous Marvel movie, this really looks like it is lifted from comics, from transitions to lighting. The Hulk himself looks…well hulking, but not in a comically big way like 2003’s version. He moves real fluid, and his transformations are very convincing. When he does start to Hulk smash things, I couldn’t help but be in awe. Even the Abomination looked awesome. Sort of a cross between the berserker from Gears of War and the Nemesis from Resident Evil, nonetheless the filmmakers crafted a visually appealing foe. While the fight scenes looked crisp, there seemed to be a lack of them. A better film than its previous incarnation, The Incredible Hulk is respectable fun but still not the film that truly places the Hulk character on par with his Avenger brethren. But as The Avengers exhibited, there is untapped potential with the green giant, and hopefully moviegoers get a focused effort sooner rather than later. Photo credits go to http://www.impawards.com, hollywoodchicago.com, fanpop.com, & geeksofdoom.com. For film focused thoughts, follow me @MovieManJackson. Dude, I love the Incredible Hulk. But dude….I hate his movies. It seems like his transition onto the big screen never goes well. It is bore after bore! The Avengers role did him right and the cartoon versions are usually excellent! I think we need Hulk to talk on-screen or have a major focus on the foe as opposed to the monster inside! Agreed sir. There is a lot of potential there but for two feature films now the character hasn’t been nailed, as well as the villains. Supposedly there is a new Hulk set to hit after the 2nd Avengers, so maybe the world is due for a solid Hulk film? I sure hope so my friend! You were correct about Mark being a good replacement! This is the only Marvel movie I haven’t seen. Your recommendation isn’t enough to make me change that for this one either. Once again, great work! And really the only movie you don’t need to see of them. While still canon, it never feels connected to the others. Keep on staying away! Plus, Ruffalo is just so awesome as Banner in The Avengers. Watching anyone else play the character seems . . . unnecessary. I really enjoy reading your reviews, I really like your writing style 🙂 it’s interesting what you said about Edward Norton perhaps being too well known to pull off Banner; I’m a big fan of the idea of revamping old comic classics with unknown actors to make it less in-your-face Hollywood esque. Not that it will ever happen though! I am a firm believer that some roles just need to be casted with a lesser known individual. Not at the sacrifice of acting of course, but in some cases it is easier to buy into a character when the actor is not that widely known. I completely agree. As soon as an unknown is introduced they tend to appear in different films afterwards and become household names so it would be beneficial to add to the pool of available actors too! A bit more variety! Glad you enjoyed bro. Thanks for the comment!